The night before the first big Occupy Wall Street rally at Foley Square in early October, I went to my local bookstore to hear Chris Lehmann speak about his new book, Rich People Things, which explores, with penetrating hilarity, the follies of the “one percent.” During the discussion, a number of us were struck by the way the obscenely wealthy few are proud to be an “elite” in contrast to the way the term, along with kindred ideas like taste, discrimination, and distinction, have been completely discredited—vilified—in matters of culture. From there the discussion turned to the poverty of our language of dissent and revolt, the resourcelessness of our political imaginations. The historians among us spoke of the radical labor movement that emerged in the last part of the nineteenth century and offered a number of examples of their compelling visceral imagery—plutocrats as “blood-sucking parasites of property”; the factory labor system as “a prison-house” or “chattel slavery”; the competition between men that underwrites capitalism as “bestial”; industrial cities as “inexpressibly base and ugly.” A young woman in the audience said that the nineteenth-century language did not sit well with her and that her generation did not feel comfortable with the language of 1960s “Up against the wall, mother-f-er” confrontation. She expressed some concern that her ivy-league college education—she had been an American Studies major—had made her so hyper-sensitive to speaking ill of anyone that she no longer had words that felt right to her to condemn those responsible for wrecking our country. Happily this sensitive young woman’s concerns turned out to be misplaced. Her generation’s commitment to inclusiveness, in the hands of the Occupy Wall Street movement, has unexpectedly and against all odds reinvigorated our political life. Here I am thinking of the statement on their website—“Occupy Wall Street is a leaderless resistance movement with people of many colors, genders, and political persuasions”—as well as their slogan, “We are the 99 percent,” and their brilliant improvisatory answer to the prohibition on using amplification at Zuccotti Park—the surprisingly moving and effective “mic check,” which makes everyone present stop, pay attention, and participate, as all those within earshot of the speaker repeat as a group—a kind of human microphone—phrase by phrase, what the speaker is saying. Their ringing egalitarian language delivered by this improvisatory method has given many of us who have long felt demoralized a reason for hope. Still, I don’t think my husband was alone in being surprised by the good feeling of the huge rally at Foley Square on November 17, which marked the two-month anniversary of Occupy Wall Street. Yet, how could one not feel jubilant to be part of a vibrant, attractive crowd that stretched in every direction as far as we could see (later estimated at 32,000), whose chants—“We are unstoppable! A new world is possible!” was one of the favorites—reverberated along the stone corridor of soaring, lit skyscrapers as we marched down Broadway to the Brooklyn Bridge at dusk? It was a wonderful contrast to the scene just six weeks before, when over seven hundred men and women had been roughly corralled and arrested as they tried to cross the Brooklyn Bridge on a Sunday afternoon. Later that night, as we spoke further about what we had experienced, I agreed with my husband that there did seem to be a new kind of civility emerging and, given the youth and sophistication of many of our fellow protestors, perhaps we were seeing the fruit of college educations that we had been in the habit of dismissing as “politically correct.” After all, what was the call for “non-hierachical relations” but a call for respect for the dignity of others, although in literature and art departments, it had felt like a kind of displacement, anemic in comparison, to what we were now seeing in the streets? My husband then reminded me that non-violent resistance/action demands a recognition of and respect for the humanity of one’s oppressors. And the Occupy movement is vehemently anti-violent; their inspiration is the Arab Spring. Now, as I write these words, I thought of the horrifying video of the students at UC Davis—not the sensational minute or two where defenseless students are pepper-sprayed by Police Lieutenant John Pike and that the whole world has seen, but rather the far more stunning incident about six minutes after the cold-blooded assault that never made it onto television news. We are giving you a moment of peace. You can go. We will not follow you. Then, the students as a group shout, “You can go! You can go!” And the police as a group warily back away and leave. At which point the students, surprised by their victory, erupt into cheers and applause, followed by “Shame on you! Shame on you!” That this young man had the presence of mind, the poise and courage, to speak as he did at that frightening, chaotic moment astounds me. I have to admit that I have also been astounded every time I have heard protesters yell “shame” at the police when they use brute force to arrest someone. Just when I had thought the word, let alone the idea/feeling/sensibility, had disappeared from the popular conscience. But now, after seeing the effect of that young man’s improvisatory civil speech—“Please do not return”—I am now wondering whether “Mic check!” followed by concise instructions delivered in a civil manner is not a more compelling way to make the police stop and pay attention to what they are doing. It certainly turns the tables on them in a powerful and creative way. The look on their faces—they were literally disarmed. As luck would have it, as I was mulling over these things, an essay entitled “Another Realism: the Politics of Gandhian Nonviolence” by Karuna Mantena came to me in an email from the organizer of an intellectual history seminar that I sometimes attend. Reading this paper, I began to take in the enormity of the spiritual discipline required by those who would undertake non-violent actions like civil disobedience, non-cooperation, boycotts, strikes, let alone hunger strikes. Gandhi, I learned, had an astute sense not only of the moral but also of the psychological qualities the non-violent protestor would need to cultivate. He recognized that there is an inherent tendency toward escalation in all conflicts, which, in turn, gives rise to entrenchment, resentment, and mutual hostility, which, in turn, inflames egoism, pride, and cowardice, and thus it was incumbent upon protestors to cultivate “unobtrusive” humility and fearlessness. 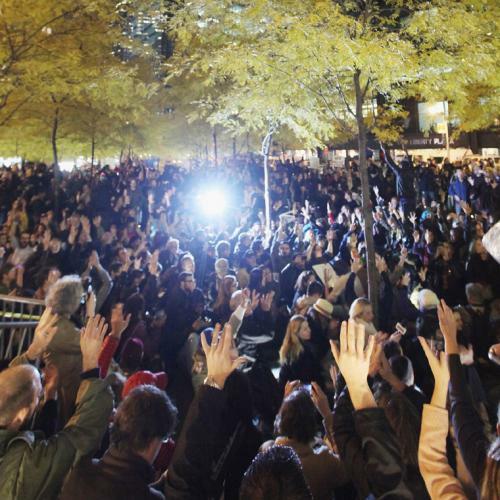 As luck would further have it, a few days later, Occupy Wall Street announced that it was holding a General Assembly meeting at the Lincoln Center on December 1. The occasion was the last performance of Philip Glass’s Satyagraha (“truth-force”), an opera loosely based on Gandhi’s life, and Occupy Wall Street wanted to draw attention to “the striking irony” that Mayor Bloomberg’s company, Bloomberg L.P., is one of the leading corporate sponsors of Lincoln Center at the same time that Bloomberg, as mayor, had protestors arrested and forcibly removed from Zuccotti Park for exercising their First-Amendment rights of peaceful public assembly and free speech. We arrived at 11 p.m. to see what has become a familiar police-state sight: a large number of demonstrators pressed into a ridiculously narrow space between barricades guarded by rows of armed police. And this with the large, open plaza of Lincoln Center before us! Philip Glass had promised to speak and before he arrived a number of fellow protestors were employing the “mic check” to speak. As more and more people joined our assembly, the enforced narrow corridor was becoming uncomfortably tight. Then, again, it happened: Suddenly a large number of people raced toward the barricades and a wave of anger engulfed our crowd. “Shame! Shame on you!” “The whole world is watching!” Which meant that yet another person was being arrested. This time, I did not join in the chants. Instead I thought of Gandhi, of his insistence on the absolute need to purge one’s self of all traces of anger and resentment toward one’s opponents, that he thought of this as a means of self-discipline even as it also had the good effect of not inciting bitterness, anger, and retaliation. Gandhi meant what he said about unobtrusive humility, going so far as to insist that one should never attempt to embarrass or humiliate one’s opponents, which, for him, were coercive tactics that gave fuel to the cycle of violence. But at Lincoln Center that crisp, fall night when the police were coming down in brutal force upon one of our crowd, I did not feel humility nor, I suspect, did my fellow protestors as they continued, ever more enraged, to chant, “Shame!” no doubt feeling the energizing thrill of righteous indignation, I thought, with some embarrassment, of moral superiority. Gandhi’s spiritual discipline against anger and resentment, rooted in the central Hindu principle of ahimsa—refraining from causing harm to any living creature—inspired some of the most powerful writings of the theologian Reinhold Niebuhr and the powerful actions of the Reverend Martin Luther King, and now it struck me that these three men moved on a different metaphysical plane from those who would practice civility under pressure, which itself takes extreme discipline and creativity. As I listened to Philip Glass’s metaphysical prophecy from the closing song of his opera, Satyagraha, repeated after him, line by line, full-voiced by my enthusiastic fellow protestors, I knew that this was an orientation far beyond the reach of most of us, certainly myself. Rochelle Gurstein, a monthly columnist for The New Republic, is the author of The Repeal of Reticence: America’s Cultural and Legal Struggles over Free Speech, Obscenity, Sexual Liberation, and Modern Art. She is currently writing a book on the history of aesthetic experience tentatively entitled Of Time and Beauty.